The Hoboken Board of Education election race is beginning to heat up as gears ramp up among two slates for this November with an eye poised on 2017. The race of local import coupled with the sizable presidential election is the three seats on the nine member Board of Elections. The BoE race is viewed by local political observers as the prelim to City Hall elections next year and for good reason. The two elections almost always mirror the strengths and weaknesses of its two main rivals. Last year, the Board of Education reform oriented slate Reach Higher appeared to have swept their opponents until the late surge of Vote-by-Mail on election night overtook two of their three candidates. The current balance of powers in a 6-3 alignment means the three seats this November are pivotal to who will have oversight over an almost $70 million BoE budget for the growing school district. 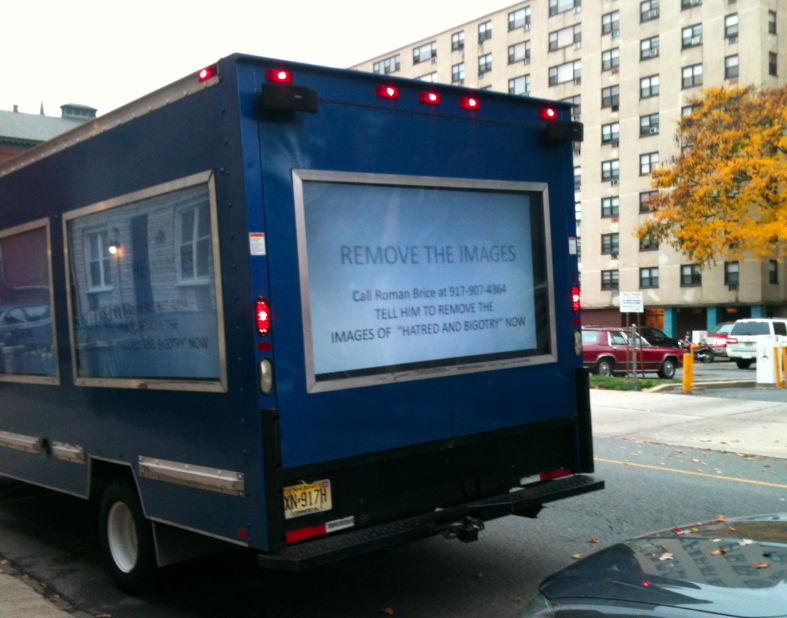 The Old Guard Nazi Truck seen here in 2012 in one of its many trips through Hoboken attacking the reform movement with use of a Nazi flag in a looping attack video. 2012 is the last presidential campaign and will see the biggest parallel to this year's BoE race in both interest and turnout. With one eye cast to 2017 and the mayoral election, this year's BoE election most closely mirrors the 2012 race, the last presidential year. That election saw the controversial appearances of the Move Forward Old Guard slate's less than secret weapon: The Nazi Truck. Before the Nazi Truck's last appearance showing an ad for the Move Forward slate, it patrolled Washington St. and parked in front of the BoE and City Hall before government meetings looping a controversial video attacking BoE trustees, council members, Mayor Zimmer, this editor and Grafix Avenger with a prominent Nazi flag flying in full color. The ensuing controversy would gain national attention and left a stain on all involved and its hidden sponsors being hosted at the Mason Civic "charity" office uptown where the Move Forward campaign was headquartered. The gory details were eventually revealed in a feature story here when the truck owner went on the record describing his unhappiness in having any involvement. The Old Guard is looking to avoid that disaster with three new faces to vie against a ticket of incumbents Jennifer Evans, Irene Sobolov and second time candidate Sheillah Dallara. Their upstart opposition is already looking to get over the top taking issue with the years long running suit involving the HoLa Charter school expansion. The rest of this story is MSV premium and will go out today to members via email.